The creativity depicted with tattoos is truly mesmerizing. You can find plenty of designs out there. There is no limit to the expressions involved in these. Moreover, these beautify the looks of a girl more than ever. While image-based tattoos look great, the ones showing of a great quote looks fantastic as well. It adds in more charm to a girl who wants to flaunt her personality. A carefully chosen quote can tell a lot about what a girl loves about the world or herself. 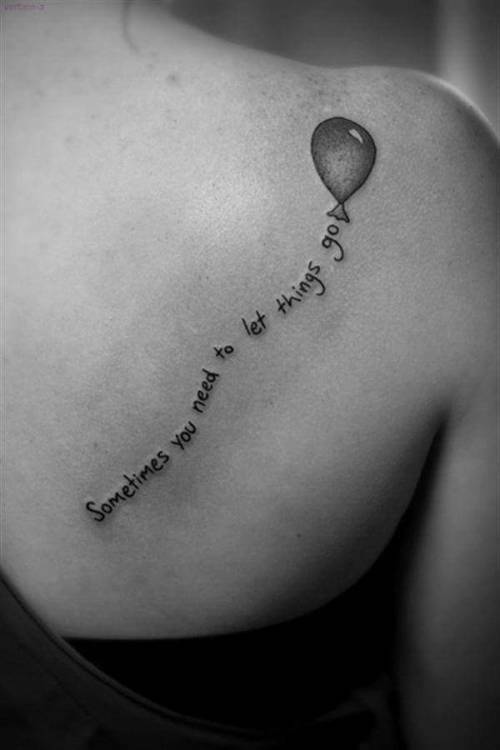 Which is why, this post will offer great tattoo quotes for girls so that they can display their traits openly. If you are the type of girl who wants to portray a positive remark through a tattoo, then these are the ones you should go for. Plus, the positive message will not embarrass your from showing others either. You can choose quotes that have a deep meaning in this category. Or even a message that depicts your emotional self could be great for flaunting around. Tattoo quotes don’t have to be highlighting a good and positive message. If you are the type who doesn’t feel ashamed of a flirty one, then go for it. There is nothing bad in showing your naughty self through a tattoo either. But, do make sure that the message is not a vulgar one. That would ruin the tattoo and you might not be able to carry it around comfortably. Maybe you are too sensitive but feel uncomfortable to put your heart out, even though you want to. Why not use a tattoo to express yourself. Your personality can be reflected through a simple quote that shows up your emotional interiors. Just choose a good one that suits the emotional aspect perfectly and get it done. This will surely help you calm yourself down, believe us. A popular way to demonstrate how much you love your partner or family member. Many celebrities do it too. You can get a message imprinted which is dedicated to the person you are getting a tattoo for. But, make sure that the person is someone you are willing to go this far for. You do not want to be left heartbroken in some situation in the future as then you will require a tattoo removal procedure to get it off. Inspiration can make many build up their confidence. So, why not use an inspiration quote as a tattoo on you? There are plenty of them present. Some big, while other small. But, keep in mind to use an inspirational quote that is compact and catchy. A few words of truth and wisdom can make a difference. So, choose something to motivate girls, boys or both. A majority of girls love nature which can be a great way to show how much they adore it. Using quotes talking about the trees, sea, wind or anything related to the natural environment can be chosen for this one. It will certainly be a great way to impress your friends and family. It will also show your simplicity while being modern about the way you look. If you love poems then you can show your favorite stanzas through your body. Just choose a famous quote and get it tattooed on your body. It is a great way to show how much you love the beauty of poems and literature. This is another popular idea of getting a tattoo. You might be having a favorite movie quotes. Displaying them on you will offer you to proudly adore its beauty. Find a nice movie quote that reflects your personality or perhaps has a deeper meaning hidden inside of it, and get it inked on your skin to flaunt it around. Tattoos are great ways to express ourselves. Girls nowadays are going for these even more. With popular quote ideas, you can have lots of them to choose from. Quotes are equally lovable just like image tattoos. The former ones too have a deep and creative meaning hidden inside of them. Or should we say, a much deeper meaning as the viewer uses his own imagination to create a picture out of the words. An image tattoo, on the other hand, already has the graphic work done. So, there is less creativity compared to the quotes-based tattoos. Despite it all, you should understand that tattoos can be harmful too. You should understand the effects these might cause before getting one. If you do not want a permanent one, then you can always get a temporary one of your favorite quote. Those might not stay forever, but still look great on the skin. Make sure you also check out our latest 20 Hot Fairy and Angel Tattoos Design For Women post for a different but also inspiring look.